Saturday, April 13, 1912: I was so busy mending my numerous rips and tears and getting to something like they ought to be. Grandma probably was mending the hole in her waist (shirt) that she got on April 10 when she fell and hurt her shoulder. Since the diary entry that Grandma wrote a hundred years ago today is self-explanatory, I’m going to share an article in the local paper from a hundred years ago today. The Civil War ended 147 years ago. The surviving veterans, and other heros and heroines, were very elderly. On April 13, 1912 the Milton Evening Standard reported Clara Barton’s death. She’d died the previous day. 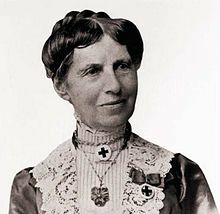 Washington, April 13—Miss Clara Barton, founder of the American Red Cross Society, died at her home in Glen Echo, Md. The cause of her death was chronic pneumonia, with which she was stricken about a year ago. Her brother, Stephen Barton of Boston, was with her when she died. Few names in all of the history of American philanthropy are better known than that of Clara Barton. Her life of ninety years, beginning with the happy significance on Christmas Day, in 1821, was given almost entirely to the cause of alleviating human suffering. Even in her old age she experienced no decline of faculties or activity, and almost to the very end declared that it was work which kept her young. . . It was in the Civil War that Clara Barton first became a national figure. She faced all of the horrors of the campaigns in the south and was a pioneer in lending the healing touch of women’s hand to the wounded and sick of the battlefield. She was also of great service in the work of searching for the missing. In 1865, she laid out the ground of the National Cemetery at Andersonville. . .
Posted on April 13, 2012 April 13, 2012 by SherylPosted in OtherTagged 100 years ago, diary, family history, genealogy. Interesting. I didn’t really know much about Clara Barton aside from her nursing during the Civil War. Several years ago my children visited the Clara Barton National Historic Site in Echo Spring, Maryland. The site contains her home (which was also the Red Cross headquarters). It is in a suburb of Washington DC. They enjoyed it, though they said that they were the only people there that day. I think that the park has a lot about how she founded the Red Cross in addition to what she did during the Civil War. I think my comment to Kristin and your comment passed in cyberspace. It is absolutely amazing how we both were thinking about the Clara Barton National Historic Site at the same time. What an interesting and amazing woman. I’d never heard of her before sonhave learnt something new today. When I was a child, Clara Barton was one of the few women included in US History textbooks. How interesting Sheryl. Our history books were full of British history, not Australian. Interesting–I realize that Australia was part of the British Commonwealth, but it seems like Australia would have a rich history of its own and would have guessed that the textbooks would focus on that. It’s amazing the things we learn as a result of our blogging! Indeed it is amazing what we learn. These days the focus is on Australia’s own history but at the school level that’s only occurred in about the last 30 years or so. When I was a child in primary school it was all about the Empire. How times change…for the better in this case. Sheryl, what an interesting take on today. A good reminder of a woman whose life was given to serving her fellow mankind. Nice touch. I’m glad you enjoyed it. I happened across this story when I was searching the microfilms for the obituary of Grandma’s friend who died. I never found the obituary, but this is the first over several interesting stories that I plan to share over the next few days. That’s what I like a genealogy research. Even if I don’t find what I’m hunting, I inevitably find something interesting. Clara Barton was one of my heroes when I was young. Thanks for the reminders. Thanks for taking a few moment to write the nice note. It’s great to hear that you enjoyed today’s post. Clara wonderfully devoted her life to making the world a better place. What a wonderful perspective! Thanks for sharing the quote.